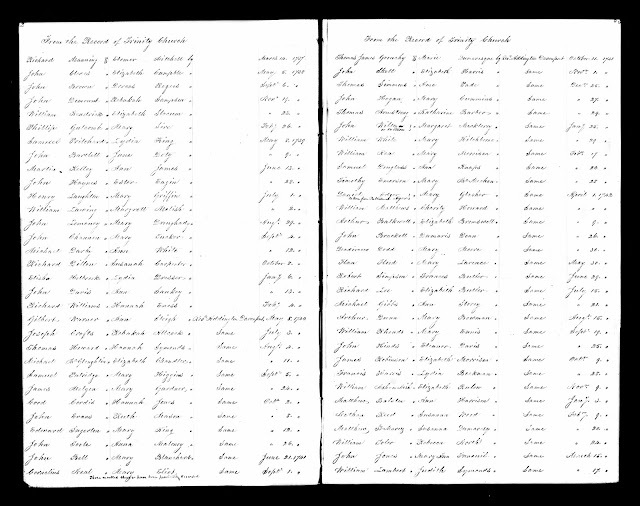 "Massachusetts, Town and Vital Records, 1620-1988," digital images, Ancestry.com (http://www.ancestry.com : accessed 16 August 2017), Boston > "Church Marriages, 1751-1761," Trinity Church (image 29 of 61), Nathan Reed and Susanna Wood marriage entry, 1742. This marriage record is for Nathan Reed (1719-1802) of Woburn and Susanna Wood (1724-1780) of Woburn, solemnized at the Trinity Church in Boston, Massachusetts. The correct date is 9 February 1742/3, although the entry says 1742; the last six entries on the right-hand page are in date order after November 9, 1742 and are surely 1742/3 due to the 1752 change in calendar dates. Note: I don't add 9 days to the pre-1752 dates in order to bring it up to the current calendar relationships. 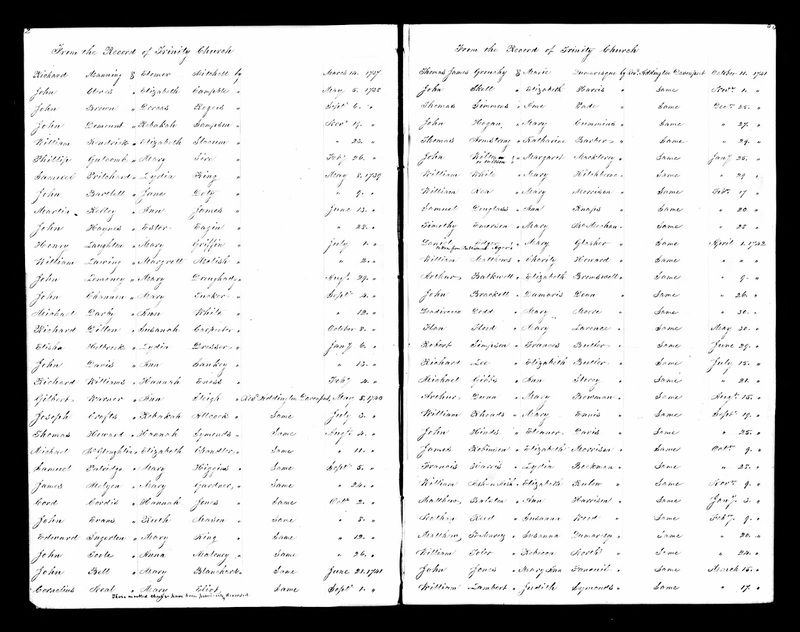 Since this is a transcription in a Boston record book of the original record in the church record book, it is a Derivative source. There are six entries in this Massachusetts town and vital records collection on Ancestry for this marriage, and they are all derivative sources and they all agree. Nathan and Susanna (Wood) Reed are my 6th great-grandparents, through their daughter Susanna Reed (1745-1833), who married Simon Gates (1739-1803) in 1766 in Marlborough, Massachusetts and resided in Gardner, Mass.. The year-dates "yyyy/yz" were not used until the date change of 1752.